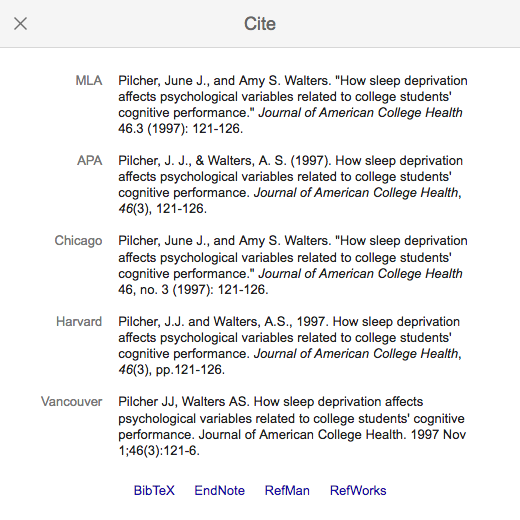 Google Scholar will generate citations using MLA, APA and Chicago styles. Click on the "cite" link (quotation mark icon) below the article record to generate citations. Select your preferred citation style; copy and paste the citation into your bibliography. You can also export the citation to the bibliography manager of your choice. NOTE: although all of the information will be included for the citation, the formatting may not be completely correct. You are still responsible for checking your citations to make sure that they are correct.